I’ve never seen a Robin’s Egg before… that wasn’t plastic or in a Martha Stewart magazine.. 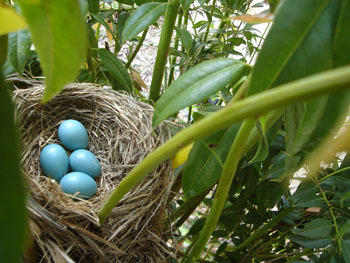 In the front of our new house, a nest with little blue eggs… my favorite blue color in the whole wide world, actually :) I had no idea this color occurred in nature. Wow… this year. I’m the first to admit that I’m frightened by change… so I assume that’s why I changed half-a-dozen major aspects of my life in one swoop. It’s like taking off a dozen bandaids… at once. Sure, it hurts… but only once! As everyone knows, moving is a chore… we’ve been here a week and there are still boxes everywhere, I can’t find any scissors, I still have bills to pay from Los Angeles and the store… but which box are the stamps and envelopes in, or… the company checks?? 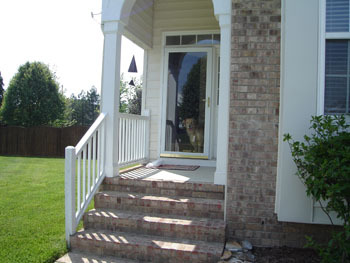 *sigh* They’ll turn up… along with my marbles ;) Pictured above is Meg guarding our new front door which has a clear glass “screen” door… for bird watching ;) She loves it… and she loves this house. The second we got her into that yard she pranced around like she owned the place then went up on the deck and I could swear I heard her say… “mine”. She runs up and down the stairs and all of her toys have made their way to the top of the stairs, where she likes to perch and keep an eye on things. 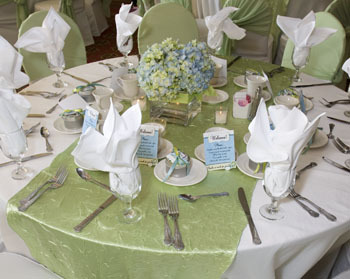 We had blue, green and white hydrangeas on each table… along with a welcome card and candles with custom matchbooks. 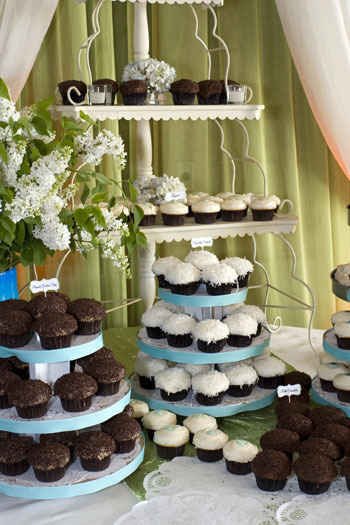 Sprinkles cupcakes… in 7 flavors. 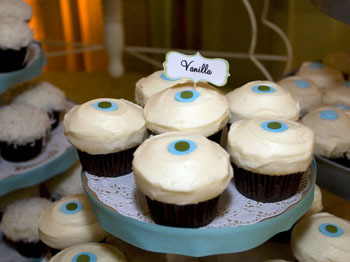 Little tags on each cupcake grouping. 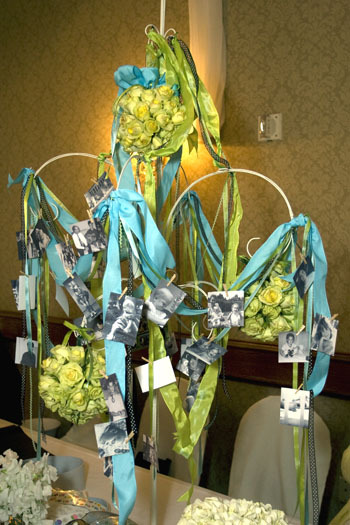 I got this idea to do a picture tower/may pole thing with lots of ribbons and hanging black and white photos of Nathan and I as kids… but… it looked a little messy… but we got a lot of color in there! We also made these rose balls and hung them on there… which I LOVE. These were the lemonade roses… a yellowey-green rose that smelled divine, they were so gorgeous!